Split pea soup could be my favorite soup. Prior to my celiac diagnosis, I frequently cracked open a can of Amy’s split pea soup for as part of a quick dinner after class. So, when I found out I couldn’t eat it any more (Amy’s does not have a dedicated gluten-free production facility), it became one of the things I missed and craved the most. That was until I discovered this recipe. I was initially intimated by dried legumes. The effort of having to soak them for hours, sort, wash and then boil them for a long time seemed like too much work. But, fortunately, the nice thing about spilt peas is that they do not require soaking time, which helps to make this recipe extremely simple. I use water in this recipe. If you have a favorite gluten-free and vegan vegetable broth you could use that, too. Just cut back on the salt afterwards. It’s so creamy it goes well with gluten-free and vegan crackers. I also enjoy topping it with salty popcorn. Combine all ingredients into a medium-large sized soup pan. Bring water to a boil. Reduce heat to a simmer and cover. Simmer for 45-50 minutes or until the peas and veggies can be smashed easily with a spoon. 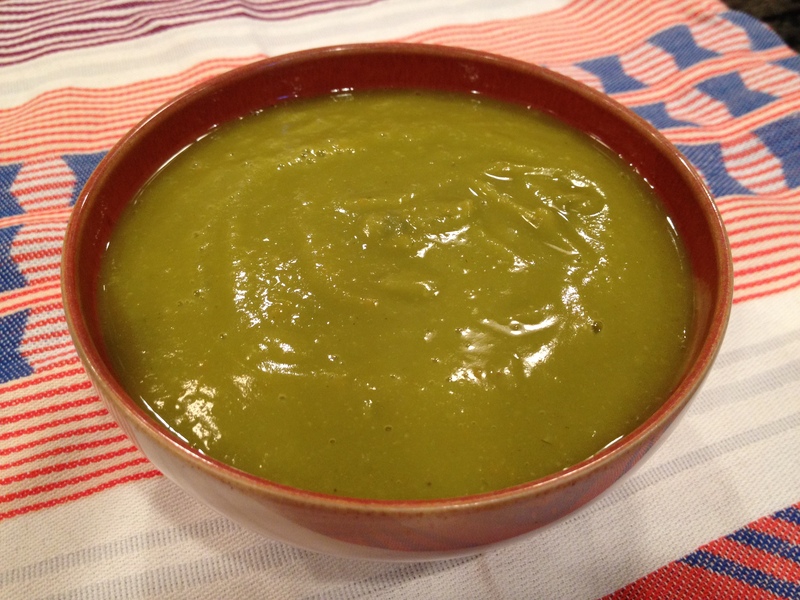 The using an immersion blender or regular blender, puree the soup until its smooth and creamy. Serve immediately, or transfer back to the soup pot to keep warm if using a traditional blender. Makes about 3 cups of soup, which is good for a giant dinner-sized bowl of soup or three side portions.